Preferred Habitat: Woodlands and thickets. Seasonal Occurrence: Uncommon in spring; occasional in fall. Profile by Meghan Anne: After narrowing down your bird to a thrush by it's spotted throat and chest, you can confirm it as the elusive Gray-cheeked Thrush by its grayish face, faint pale eyering, brownish gray upperside, and extensively dusky flanks. The similar Swainson's Thrush has bold buffy spectacles. Gray-cheeked Thrush migrates throughout eastern North America. Migrants are uncommon in most regions, but can potentially be found in any wooded habitat with thick understory. They will be foraging mostly on the ground for insects and fruit. Look for them during migration in our High Island Sanctuaries where they have already been spotted this season. It breeds in boreal forest and tundra scrub, and winters in tropical forest. 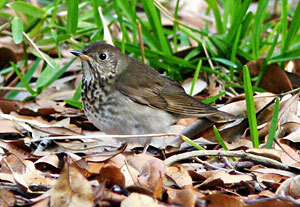 Bicknell's Thrush is nearly identical in the field but does not migrate through Texas. It stays along the east coast. Bicknell's and Gray-cheeked Thrush were only recently separated as two species, and consequently much of the research that was produced on 'Gray-cheeked Thrush' was actually about Bicknell's. They are often closer to where people live and are therefore easier to access.